We report empirical evidence indicating that US business formation has recently turned more volatile, procyclical and persistent due to changes in exit dynamics. To study these stylized facts, we estimate a DSGE model with endogenous entry and exit. Business units feature heterogeneous productivity and they shut down if the present value of expected future dividends falls below the current liquidation value. The estimation results imply structural changes in US exit dynamics after 2007: the semi-elasticity of the exit rate to critical productivity has increased and the average plant-level productivity has decreased. Casares, Miguel, Khan, H.U, & Poutineau, Jean-Christophe. (2018). 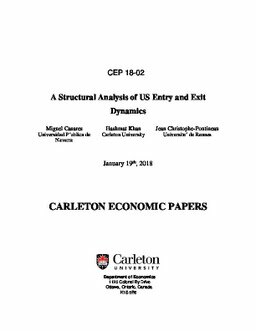 A Structural Analysis of US Entry and Exit Dynamics (No. CEP 18-02). Carleton Economic Papers (CEP). Department of Economics.